This is a blog. This is only a blog. In the event of a real emergency, please check Twitter. We got our hands on a Samsung Gear 360 camera at work a few months back, and I've just been waiting for the right project to put it to good use on. One thing we always like doing in the Marketing department at 3Pillar is helping out our good friends in HR/Recruiting. After all, they're the ones who dictate who we're going to be surrounded by for most of our waking and working hours. We might as well try to help them bring in the good ones. We were pretty pleased with the way it turned out. Sure, Klenn could have actually memorized his lines...but he did a pretty darn good job ad-libbing his way through. A company called OnGig came across the video and thought enough of it that it made their list of 10 different types of recruiting videos - they called it one of the most engaging videos they've seen. Without further ado, check out this video where you can, quite literally, "See Yourself Working at 3Pillar." Please forgive the video starting on the elevator doors...we're still getting used to the camera! I ended up losing this Nerf duel at work thanks to some eagle-eyed marksmanship from my arch-nemesis Klenn Harrigan. The main lesson I learned is that he is an amazing shot. I believe my bald spot might also be growing. What lessons do you get from it? Let me know in the comments below! The day we landed just so happened to be the last day of the Tour de France, so we caught some of the riders coming into Paris. At left is the main squeeze, Nancy, with some of the Tour riders zipping past in the background. Nancy spent 2 years in Paris in college, so she was the best traveling partner and tour guide a guy could hope for. She speaks fluent French, navigates around Paris like nobody's business, and most importantly, she knew exactly where to put our lock on the Pont de Solferino so that we would be able to find it in the dark later in the trip. She is a keeper through and through. While you could spend months in Paris and not see all that there is to see, we did a pretty good job of packing in a ton over the course of a week. The Louvre, the Arc de Triomphe, the Musee d'Orsay, Montmartre, the Eiffel Tower, and Versailles were just a few of the highlights. 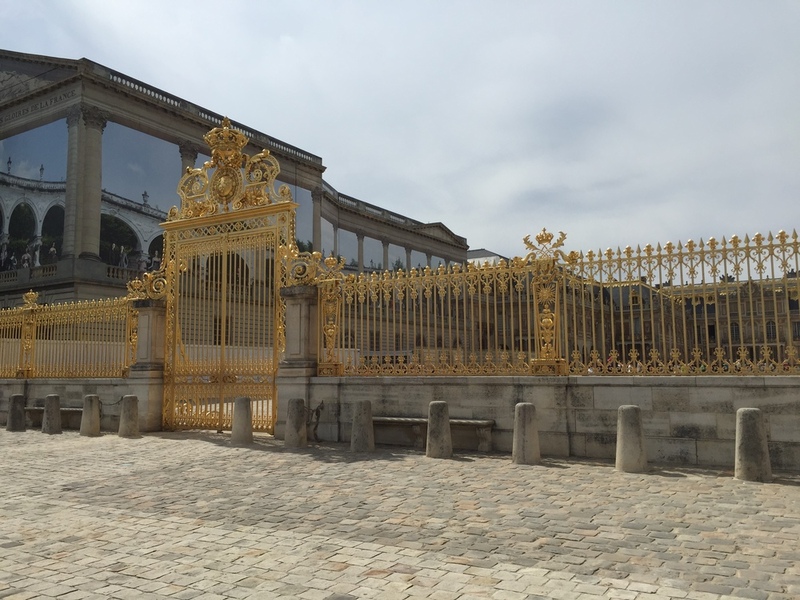 You can see just a little bit of the grandiosity of Versailles on display below. Suffice it to say, the Sun King was living the good life. We hit Versailles on the last day of the trip, and the Versailles visit was capped off with a fireworks show that is only put on a few times a summer that was really amazing. You get to spend hours navigating the gardens at Versailles with classical music on blast and champagne flowing like it was the 18th century all over again. As amazing as Versailles and the rest of the trip were, by far the best part of the trip was getting down on one knee at our lock on the Pont de Solferino and asking Nancy if she would spend the rest of her life with me. After first asking if I was serious, she said, "Oui, claro," or something to that effect. We may never be royals, Nanou, but we'll always have each other. And, of course, we'll always have Paris. On a recent episode of The Innovation Engine podcast, I spoke with marketing and branding guru Dr. Leigh George about the growing importance of Marketing in the corporate world. Leigh is super sharp, and we had a great conversation about how marketing touches more parts of a business than ever before, from Sales to Product Development to HR, and many other points in between. Leigh recently launched her own company, which is called Freedom, to "help organizations who feel stuck clear the way for innovation." Prior to starting her own company, she served stints as the VP of Social at Ogilvy, Director of Strategy at R2Integrated, and Director of Strategy at Rock Creek Strategic Marketing. Leigh is one of the few people in country with a Ph.D. in Branding History and Theory. You can check out her profile on LinkedIn to see some of her presentations on marketing, social media, and branding, which are very thought-provoking. We recently started posting episodes of the podcast on SoundCloud. Give the episode a listen via the SoundCloud embed above. If you like what you hear, please share it on your social media network of choice. You can download or subscribe to the podcast on iTunes or Stitcher Radio. I had the pleasure of interviewing Golden Krishna of Zappos for a recent 'Innovation Engine' podcast about the premise behind his book, The Best Interface is No Interface: The Simple Path to Brilliant Technology. Golden's book is frequently laugh out loud funny, and I can't recommend it highly enough. The crux of the book is that some of what should be the greatest minds of this generation have become beholden to what he calls "screen-based thinking," or the inability to solve problems without creating an app. Sensors, artificial intelligence, and the Internet of Things are emerging technologies that Golden believes will open the door to the kinds of "machine input" that will help free us from our slavery to smartphones. We also talk about some of the recent hubbub Golden's company, Zappos, has seen as a result of their shift to holacracy. The company has been all over the news and was the subject of a front page Wall Street Journal story the day we spoke. If you've clicked around this site a little bit, you know that I've been hosting a podcast on innovation for my company, 3Pillar Global, for awhile now. For the 50th episode of the podcast, 3Pillar CEO David DeWolf flipped the script and interviewed me to find out some of the most important lessons I've learned over the course of the first 49 episodes. I've been fortunate to have had the opportunity to speak to some of the world's leading experts on corporate innovation. They've certainly taught me more than a thing or 2 along the way. You can listen to the episode using the player below, and you can also download it and listen later. If you like what you hear, head on over to our home on iTunes or Stitcher Radio and subscribe to the podcast. This is why I like Bob Corn-Revere. The man is a straightshooter. Big fan of this Bob Corn-Revere character. For my Hello World blog post, I'm test driving a video embed of a card-sorting exercise conducted at 3Pillar in the fall of 2014. My co-worker Kenal Shah shot the hyperlapse video and we set a little music to it. Enjoy!